One of my favourite ways to use my Stampin' Write Markers is to ink only part of my rubber stamps or to ink the ink in more than one colour. 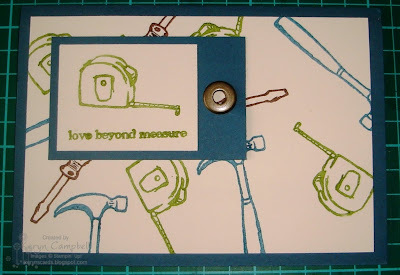 In this card I've used Old Olive, Not Quite Navy and Chocolate Chip Stampin' Write Markers to ink the tools in the Totally Tools set without the words to create a background. This was one of the cards on offer at my $2 Valentine's Card Making Day. Here is the video showing how to make the background for this card using Stampin' Write Markers.